One of the perks of having a blog for so long is that I get invited to do some really cool things. Yesterday’s event was by far the coolest. On a breezy September morning, my friend and I traveled up to the fourth floor of an anonymous building on Fifth Avenue. When the elevator doors opened, we were transported to Singapore. 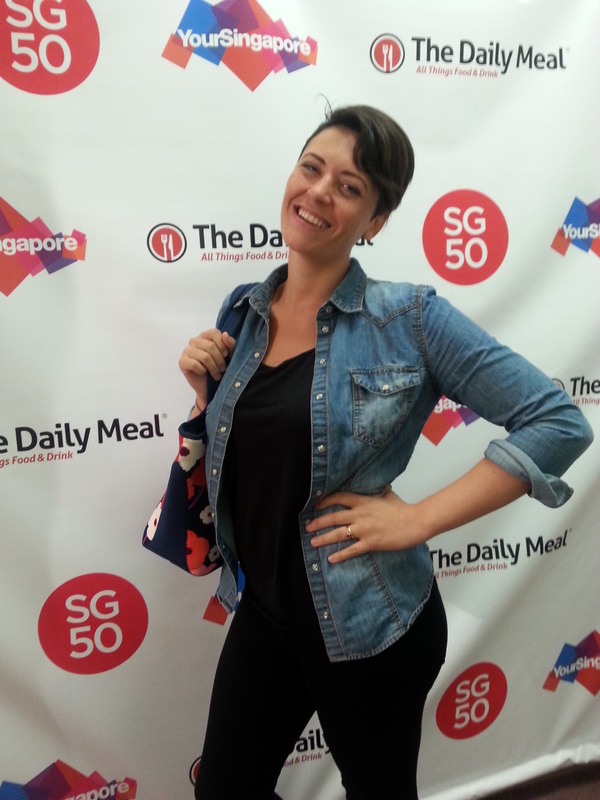 In honor of the 50th anniversary of Singapore’s independence, I and about fifteen other bloggers were about to participate in a cooking class with the top chefs of Singapore. 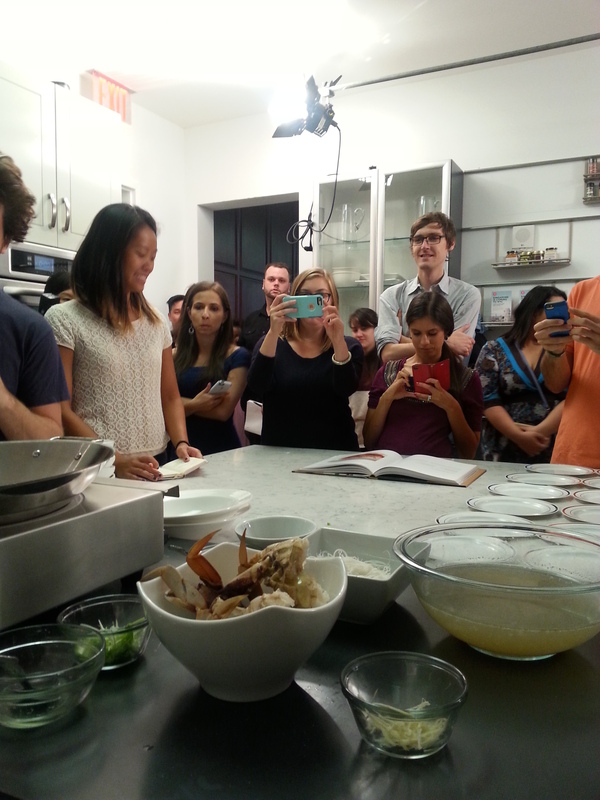 Bloggers observing chef Justin Quek of Sky on 57 making crab vermicelli in a light ginger broth. I guess if I read any of the promotional material before arriving I would have known that a ton of crab was in store. After all, the name of the event was The Singapore Crab Throwdown! 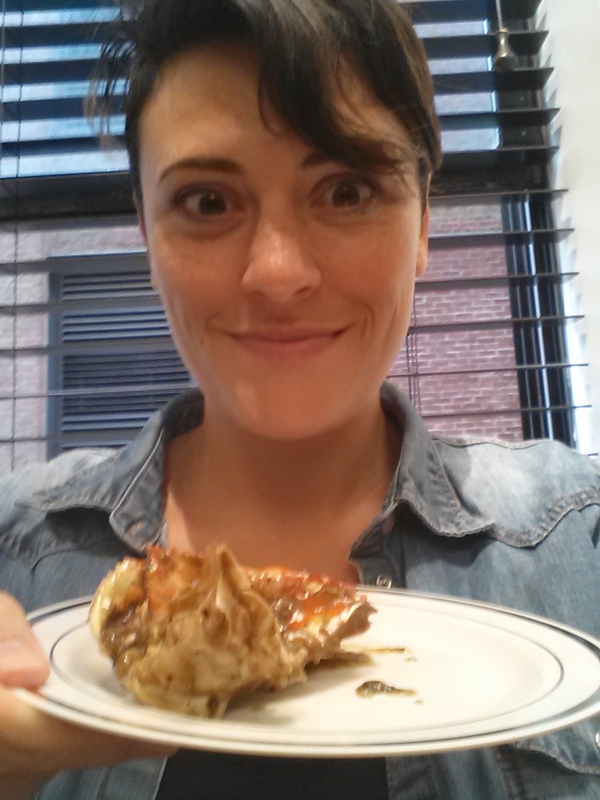 I’ve never eaten four crab dishes before noon, but I’m not complaining. The morning started out with Wayne Liew, head chef of Keng Eng Kee, going over the basic flavors of the traditional cuisine and making us some spicy, sweet and sour chili crab. The crabs patiently waiting to be dressed with chili sauce. Me with the awesome cooking staff of Keng Eng Kee. Next up, Salted Egg Yolk Crab, which sounds less than appetizing but was one of the most unique and delightful flavors I’ve ever had. Wayne told us that they ferment the yolk in salt and then add cream and some other secret ingredients to make what I would call a umamified version of hollandaise sauce. After a short break to wash our crabby hands, Justin Quek of Sky on 57 took over. Justin showed us how quality ingredients (you have to make your own broth) and the right proportions, can make an elegant, simple and divine soup. I find ginger an obnoxious overwhelming flavor, but Justin’s ginger broth was so gentle it changed my mind on ginger forever! Justin telling us about the ingredients. The elegant soup. Too bad I couldn’t eat it elegantly. The chefs were so sweet and humble even though they are profoundly accomplished and internationally renowned. I loved getting to taste how the same main ingredient can be prepared with wildly different flavors. I left desperately wanting to visit Singapore and continuing this culinary tour of the senses. If you’re in New York, there are still a few more events you can check out. As part of Singapore restaurant week, many popular restaurants are adding special Singaporean-inspired dishes to their menu. For instance, Shake Shack has a Singapore milkshake, The Meatball Shop is offering a Singapore meatball, and Bergdorf and Goodman is hosting a Singaporean feast. For more info on the events, click here. I left feeling like a super star! Posted in Singapore, travel and tagged #SG50, #SingaporeRestaurantWeek, cooking classes, Justin Quek, Keng Eng Kee, Singaporean cuisine, Sky on 57, Wayne Liew on September 23, 2015 by Tracy.